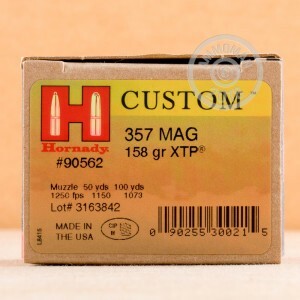 Highly regarded as one of the best self-defense ammunitions on the market, the Hornady XTP line is highly accurate and made for impact. 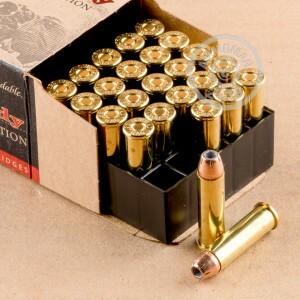 These jacketed hollow point rounds have been adopted by hunters, marksman and self-defense shooters alike for their accuracy and ability to hit, expand and penetrate at a variety of speeds and conditions. The specially designed XTP projectile has specially cut lines in the jacket to maximize mushrooming upon impact. The lead core has an even distribution to aid in full and deep penetration. These 357 rounds make a prime self-defense round and are sure to please! 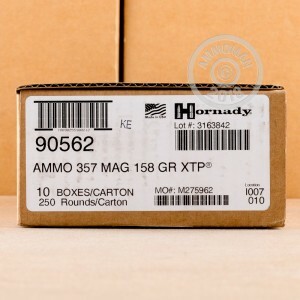 They are brass cased, boxer-primed, non-corrosive, and reloadable. You are breaking into the wrong house.